The incoming president Rodrigo Duterte announced his warning against lawmakers that will hinder his war against drugs and criminality by conducting investigations. But there are 3 senators confirmed that nobody can stop them from doing their job even the president. Duterte told in a speech during his thanksgiving party on Wednesday night, "Don’t investigate me. The road will end with me. The buck stops here. We are going to have a fight,"
"I am doing what is right, as long as it is the truth," he added. 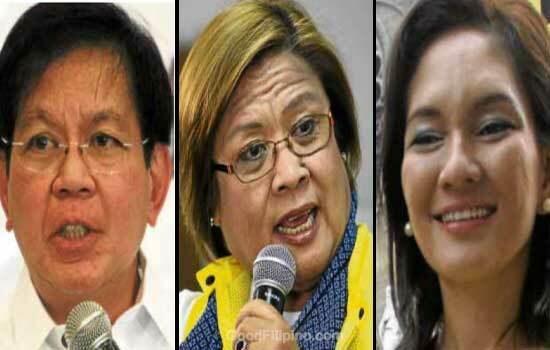 However, the three senators-elect Panfilo Lacson, Leila de Lima and Risa Hontiveros answers back the statement of the president-elect Rodrigo Duterte through separate text messages to the Inquirer. Panfilo Lacson said in his text message, "Having said that, we will conduct investigations in aid of legislation whenever necessary, and nobody, not even the President of the Republic, can dictate and stop us from doing our job,"
"The President should not and cannot stand in the way of our mandated duty," Lacson added. Leila De Lima said in her text message, "The concept of checks and balances is seemingly lost on the President-elect,"
"I don’t think any of us who will be sitting in the Senate and the House will unnecessarily hamper law enforcement just for the sake of conducting investigations," she added. Risa Hontiveros said in her text message, "Congressional inquiries could improve an anticrime campaign, as well as prevent or correct any possible excesses in its prosecution,"
"[But[ the separate, coequal branches of government must respect each other in carrying out their mandates," Hontiveros added. Aside from the three senators, there has been no feedback from the House of Representatives against the statement released by the incoming president. What would be your stand on the separate statements of the three senators? Please point your thoughts below. Comments or suggestions about "Three Senators-elect refuse to obey Duterte" is important to us, you may share it by using the comment box below.